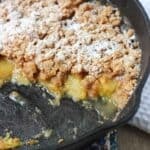 This Spiced Peach Crisp with Crumb Topping is a simple, delicious way to enjoy one of summer’s shining stars – peaches! Gooey, slightly spiced peaches are topped with a serious crumb layer (like crumb cake!) and baked for a perfect summer dessert. Top with confectioners’ sugar for a sweet touch. Peel and slice peaches (see note below). Preheat oven to 350 degrees F and lightly grease the bottom of an 8-inch cast iron skillet or baking dish (I used butter). Place peach slices in a bowl and pour in orange juice, 3 tbsp of the brown sugar, and 1/4 tsp of the cinnamon. Gently stir so that brown sugar dissolves and the mixture is just about evenly covering peaches. Add peaches to prepared skillet or baking dish and press lightly to form an even layer. In a bowl, add remaining 1/3 cup of the brown sugar and remaining 1/2 tsp of the cinnamon and stir or whisk to combine. Pour in melted butter and combine, and then add flour. Mix until all flour is combined and small- to medium-sized crumbs form. With hands, scatter crumb topping evenly over the peaches in the skillet. Bake for 30-40 minutes, or until the peaches are bubbling and the crumb topping has browned slightly. Let cool slightly before serving. Optional: sprinkle confectioners' sugar over top of the crumbs before serving. For a trick to peel ripe peaches, bring a large pot of water to a boil and place peaches in water for about 25-30 seconds. Immediately transfer to an ice bath. After another 20 or so seconds in the ice bath, you should be able to grab a piece of the peach skin and pull off the remaining skin with ease. If you're having trouble, the peaches potentially weren't ripe enough, but you can use a peeler to remove the skin. Of my six peaches, one needed the peeler. Crumb recipe adapted from food.com.